Every day in our work at World Relief Canada, we see the incredible things that are being done to support families as they work their way out of poverty and hunger. Esther is the head of one of these families. She is 32 years old and a mom to three children. She lost her husband, Simon, three years ago to the scourge of AIDS. 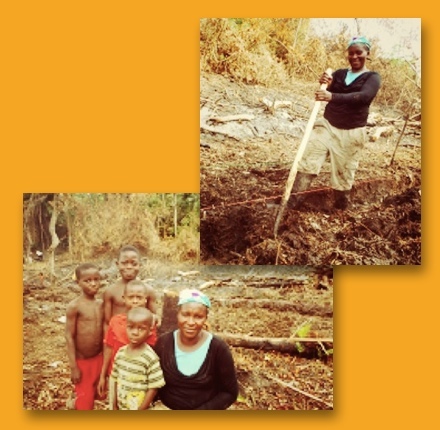 Two years ago, Esther got a loan through her Village Savings and Loan group. She joined when she realized that she needed to secure a better future for her children. Every day, she and her five-year-old daughter, Amina, work in the family’s garden plot. With the seeds, tools and training she received at the Village Savings and Loans group, their plot is thriving. Esther is proud that two of her children are in school. She is able to pay the fees from the money she earns from selling the surplus of her onion crop. She hopes that Amina will go too. But for today, Esther is thankful for the long hours she spends in the garden with Amina. The work is hard, but the time they spend together is precious. Esther knows both the value of time and the need to make the future secure for her family. She is HIV positive too. While Esther is a composite of the women we meet in our work, her story plays itself out every day for countless women and children in countries all over the world. This is your chance to be tough with a purpose. To make your toughness count. At the end of the day, if you’re a ToughMudder, you’ll do this for fun. If you’re Tough As Her, you’ll do this to live,and to make life better for your family. When we do these things we have a sense of security we know everything will be okay. We have a team that supports us. She has a team too. And she’s asking you to join. Right now. Meet, Annie. This woman lives in Liberia and has survived the brutal civil war of the 90’s. She is single mother of 5 boys, a farmer and sole provider. Annie wants her children to focus on getting an education and so she doesn’t ask for their help on the farm. Instead she tries to keep them focused on their homework. Nonetheless, one of her current challenges is convincing her son in grade 8 to finish school. Annie has farming experience, but is just now trying techniques that are new to her region. This new way of farming is more efficient and has much greater harvests. Traditional techniques never had the yield she needed to support her five hungry sons. She tried what is called upland rice farming and intercropping, but it was never enough. Annie signed up to learn new growing techniques and was able to dedicate one day a week for training. A major reason she joined is because upland farming requires a lot of help, and Annie couldn’t get the help she needed as a single mother. This project will also allow her to provide a way for her children to go to school. Not only did Annie sign up to participate in the project, she is actually the Chairlady. Members of her group include her Clan chief and his wife, but she feels empowered and supported by her community because they elected her Chairlady of the group. As a farmer herself, her biggest aspiration for her children is that they find steady paid employment. She doesn’t care whether they are doctors or accountants, she just wants them to find jobs they enjoy. She admits a little sheepishly that this is a self-serving objective as she hopes they take very good care of her in her old age! This woman lives in South Sudan is an internally displaced person (IDP) and she takes care of 6 children and 5 adults in her home. She doesn’t own any assets and she buys food by selling firewood for a living. Every day she spends 3 hours walking to the place where she collects wood, gathers what she can carry (8lbs) and walks back for 3 more hours. She does this while her husband looks for work. Are you TOUGH AS HER? We are working to provide families like Majok’s with refugee kits to help these incredible moms overcome the obstacles they face every day. 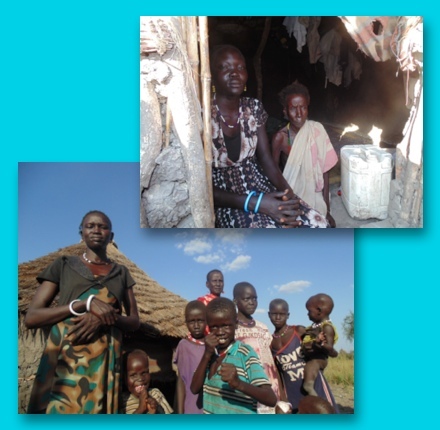 There are six children who reside with Majok and depend on her for their daily meals. Four of the children are in school, but two are too young to attend as of yet. 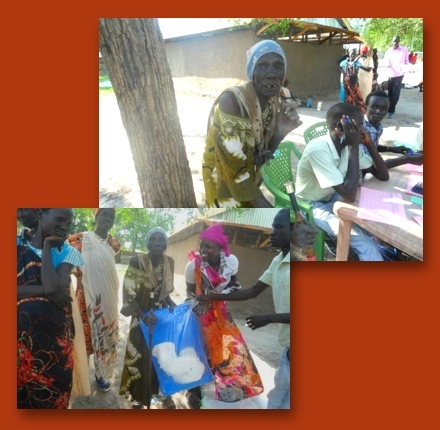 When you join Tough as Her, you are making a difference by helping women like Majok feed their kids. Majok’s family arrived in Pathai a year ago, internally displaced from their home village of Padiek. Although there wasn’t necessarily active conflict in Padiek, the security situation became so untenable for Majok that she decided to move her whole household to Pathai. Majok owns no cattle and she spends her day collecting firewood in 40 degree weather. 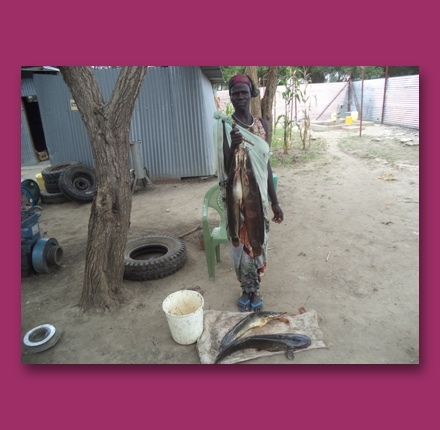 Majok is able to purchase a little bit of food with the earnings she makes selling the firewood at market. However, she is still dependent on food rations provided to her family. Her husband is currently seeking work to help supplement the family income. These kits play an important role in preventing disease outbreaks and enables Majok and others like her to more easily carry out everyday activities. Some items are life saving, such as jerry cans for collecting water, blankets or soap for maintaining hygiene. Other items simply contribute to people’s sense of dignity in difficult circumstances e.g. underwear, razors and toothbrushes. If you made a $1 a day, you would probably want to change jobs too. Today, the average person changes jobs 11 times. With your help, Nydholi was also able to make a job change, and now she no longer earns less than $1 a day. Nydholi is an IDP (internally displaced person); she fled after her village was brutally attacked during a cattle raid in South Sudan. She and her family all survived the attack. Now Nydholi faces a different obstacle. Abject poverty. Nydholi supports not only herself and her children, but her husband too. She used to be a firewood collector, meaning she’d be up early to complete all the duties expected of her as a woman, then trek for miles to collect firewood. What may seem to be a straightforward job is actually quite challenging. On top of being back braking work, the job can also include harassment, risk of running into bandits, and more. We were able to help Nydholi overcome some of the obstacles she faces on a daily basis with an Emergency Relief Kit. Among the many essentials in her kit was twine and fishing hooks. With that, she spends her time catching and selling fish rather than collecting firewood. We were able to help Nydholi and many women like her by giving them something as simple as fishing twine. That twine was provided by a generous gift that cost less than $5. Now, Nydholi has more than tripled her income and earns $10 a day from selling her daily catch. Some fishing twine to you and I may not seem like much. To Nydholi, her husband and her children, that twine means a job that provides food security and consistent meals for her family. All of that with one gift smaller than $5. When you wake up and train for ToughMudder and you’re asking yourself, “why,” remember that there are thousands of women who are still collecting firewood. They wake up early and do what they have to do at great personal risk to feed their family. Each step you jog while training and each letter you send asking for support means fewer women placing themselves at risk on a daily basis to feed their families. This woman is 82. She’s a grandmother, and like all grandmothers, she wants to give her grandkids the best. For a while, that was making sure they had something, anything, to eat that day. “My main concern has been for them to eat at least something during the day. I would spend sleepless nights thinking about what the children would eat tomorrow,” said Nyaluit. Nyaluit is a widow and an internally displaced person (IDP) who cares for her 3 orphaned grandchildren. Her son, the children’s father, was killed in a cattle raid. Over the last few years, these tribal conflicts have only become deadlier and more common in South Sudan and displacing thousands of families. World Relief Canada and our partners have been working in South Sudan to help address the growing need and we are thankful for Nyaluit’s kind words. If you’d like to be a part of stories like this one, please seriously consider becoming a committed monthly contributor and visit WorldRelief.ca/give to register and dedicate your gift to where needed most. **All donations are matched by the Canadian Government and the Canadian Food Grains Bank.